← Chaotic or coherent behaviour? Individuals don’t generally buy things for their collective benefit, so industry and government would be wasting their time trying to persuade us to buy electric cars because they offer a better long term personal transport solution for society and the environment. Electric cars are more expensive because of their lower volumes and expensive batteries. Government subsidy can help industry reach the volumes and reliability required to reduce manufacturing costs, while industrial R&D will make batteries cheaper. Fortunately, electric vehicles should be cheaper to maintain and cheaper to run. They already offer lower fuel costs which allied to the convenience and efficiency of being able to recharge them at home, may be enough to persuade some drivers to switch. Electric car fuel costs are far lower than those of petrol or diesel cars. Nissan claims “just 2p a mile” for their Leaf, which can just about be justified if you ignore battery depreciation and use the cheapest possible electricity. By comparison, a modern combustion engined car that delivers 50 mpg – about 11 miles to the litre – works out (in mid 2015) at about 11p a mile in fuel. That’s over 5 times the fuel cost of an electric car costing 2p a mile. A combustion engine also consumes lubricating oil and its propulsion system requires continual servicing which adds to its per mile running costs. But is electricity the only per mile expense an electric car incurs? The Nissan Leaf, according to the United States Environment Protection Agency (EPA), requires 30kwh of electricity “from the wall” to drive it 100 miles. This means you need 300 watt-hours of electricity from the power company for every mile you drive. 300 watt-hours of electricity (according to the UK’s Energy Saving Trust) costs 4.2 pence on a standard day time tariff in the UK. But Nissan Leaf owners can charge their cars at the night-time rate of about 2.16p a mile – which is in-line with Nissan’s claim of “just 2p a mile” claim, particularly when you factor in free recharging at public charge points. Free charging may not be available forever, but it’s currently possible to run a Nissan Leaf for the 2p a mile claimed. The motor and transmission of an electric car are maintenance-free and should last as long as the car, eliminating many of the running costs of petrol cars. But there is one component of an electric car that “wears out” – the battery. No-one seems entirely sure how fast or by how much an electric car battery wears out over time and distance, but no-one is expecting it to last as long as the car. Electric car batteries are rechargeable but they can’t (yet) be re-charged an indefinite number of times. And they are expensive – for many electric cars they account for between a quarter and a third of the purchase price. Since every kWh of electricity passing through a battery reduces its future capacity, you would think that the cost per kWh of battery throughput would be more widely known and could then be factored into the cost per mile of driving an electric car to compare it to petrol and diesel car costs. The reason it isn’t may be obvious to a cynic, but to be fair to the manufacturers, battery wear isn’t constant and depends on a number of factors. It is also improving and may eventually reach the point where the battery will last as long as the car. A lot of research goes into improving the cost, capacity, density and lifetime of batteries, factors which interplay in obvious and not so obvious ways. Ideally, we’d like our electric cars to go as far and as fast as a petrol or diesel one, take about the same time to refuel, and cost about the same to buy. We’re some way from being able to offer this at an acceptable price (though edging closer year by year) but at this stage we have to make compromises to get the best we can out of the technology in its current state. 143 wall watt-hours per mile is more than twice as energy efficient as a Nissan Leaf, so Renault could claim on the same basis as Nissan that it costs “less than 1p a mile” to run a Twizy! However, the Leaf is a much bigger and heavier car, can carry 4 people, and drive over 90 miles on a full charge compared with the Twizy’s 50. To do that, it needs 24kWh of battery, weighing 300kg (about the same as another 4 passengers). So a Nissan Leaf requires 3 times the battery weight and 4 times the battery capacity to carry twice as many people not quite twice as far. Measured in watt-hours per passenger mile when fully laden, it blows the Twizy away (as would a full electric train). But with only the driver, the Twizy wins hands down in fuel efficiency for any trip both can do. The longest range electric car on general sale is the Tesla Model 85 which can travel 250 miles. To do this requires 540kg of battery with a capacity of 85kWh. So, to go less than three times as far as a Nissan Leaf, the Tesla needs more than 3 times the battery capacity. And while that doesn’t quite result in 3 times the battery weight, the energy required to accelerate and lift that additional battery weight will use some of its additional capacity. This is why it needs more than 3 times the battery to go less than 3 times the distance. According to the U.S. EPA, the Tesla 85kwh car requires 380 “wall” watt-hours per mile compared with the 300 wall watt-hours per mile of the Nissan Leaf and the 143 wall watt-hours per mile of my Twizy. But electric car batteries lose a little of their capacity each time they are filled and emptied. Manufacturers don’t publicise the number of discharge cycles it takes for that loss of capacity to become significant, partly because it varies a lot with driving style, charging regime, and temperature. As a result, it’s hard to factor battery capacity loss into the per mile running cost of an electric car, but we can make some educated guesses. We’ve now been driving our Twizy for over 3 years, and this must have affected its capacity but it’s hard to see by how much. 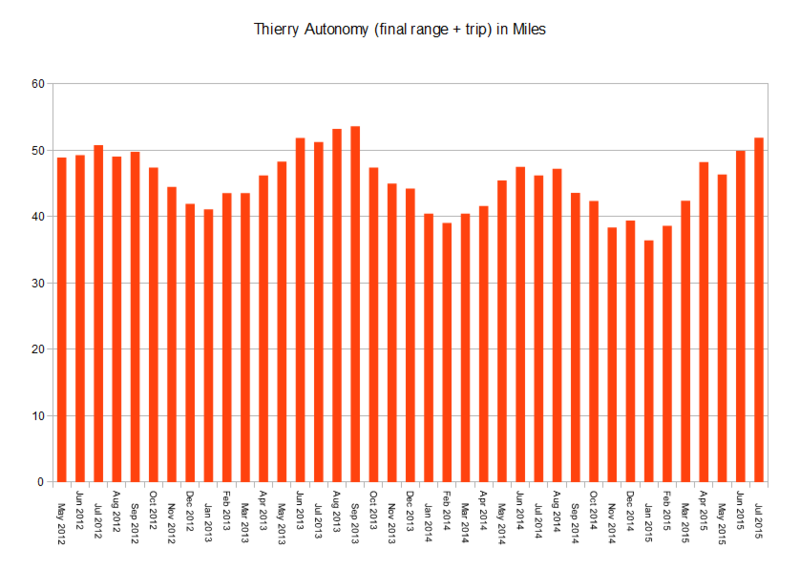 Here’s another graph showing the mean “range” of our Twizy over the time we have owned it. As you can see, this too varies with the season and, as any electric car driver will tell you, is subject to “range estimate” generated by the car, which can be misleading. The figures were recorded before each full charge and are the sum of the miles driven since the last full charge plus the car’s remaining range estimate at the start of the recharge. 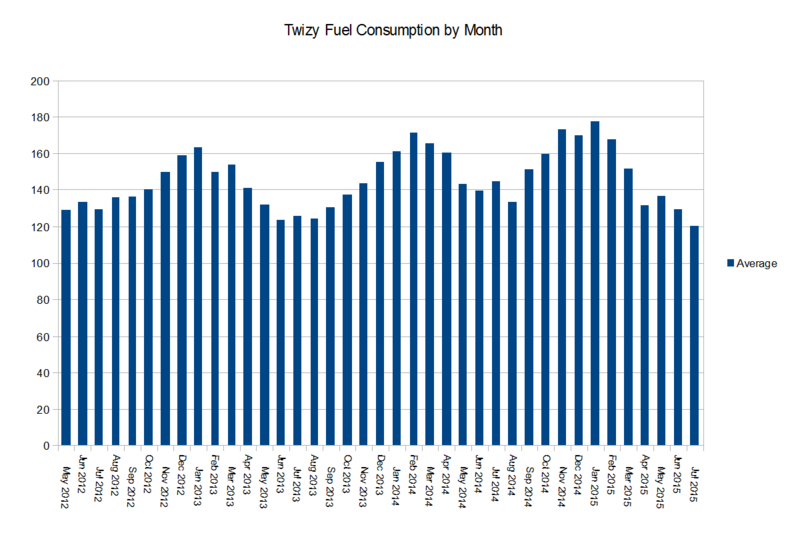 As both graphs show, our Twizy’s range and consumption figures, even allowing for the smoothing effect of amalgamating each month’s figures, vary. They mainly show the effect of temperature but there are (inconclusive) signs of battery wear if you are looking for them. If, for example, we take the range estimate for the same month each year, the midwinter range dropped 12% but the midsummer range less than 4%. At a rough estimate we may have lost around 5% of our battery in 11,000 miles. Since lithium batteries in 2012 cost just under £500 per kWh, ours were worth a bit under £3000. If we treat that 5% loss of capacity as a 5% depreciation in value then we’ve lost £150, which works out at just over a penny a mile which we need to add to the just under a penny in mains electricity. Bear in mind that these figures are distorted by the fact that batteries depreciate for other reasons. Furthermore, with a Twizy we do not own the batteries but have to rent them for £45 a month with a guarantee of at least 70% capacity over the period of the contract. £45 a month for 39 months is £1755, which works out at a whopping 16p a mile! However, the rental contract amount also finances the initial battery cost, breakdown recovery and routine servicing, so any actual per mile figure due to wear is very difficult to isolate. Nissan Leaf owners, on the other hand, do own the battery and will need to buy a new one when it “runs out” [or its capacity drops to a level they can’t accept]. A UK-based Nissan Leaf taxi operator recently reported the loss of the first 10% of his battery capacity having completed 112,000 miles and he was very pleased with that, as well he should be. If his original 24kWh battery pack was worth about £12000, then his battery loss of value also works out at just over a penny a mile. However, other Leaf owners have not been as lucky, one reporting a 33% loss over 62,000 miles – which in UK terms would be over 6p a mile. The most disappointing case was 46% loss over about 70,000 miles, closer to 8p a mile. The bottom line is that battery decay is a significant additional per mile cost for electric cars, but they still offer far better fuel economy. And this is just as well because that’s why we need to switch to them. Until we can replace fossil fuel as our primary energy source, electric cars have to deliver better fuel efficiency to be worth their government subsidy. It is ironic, in this respect, that our Twizy receives no government subsidy, while a Tesla Model S does. At 380 wall watt-hours per mile (236 Wh/km) the carbon emissions of a Tesla charged from the UK grid generates well over 100g of CO2 per km, so it would not qualify as a low carbon vehicle were it not electric. Our Twizy, on the other hand, generates about 38g of CO2 per km when charged from the grid at night, or none at all when charged from our solar panels on a sunny day. This entry was posted in Uncategorized and tagged Electric cars, EV Battery, EV costs, Nissan Leaf, Renault Twizy. Bookmark the permalink.